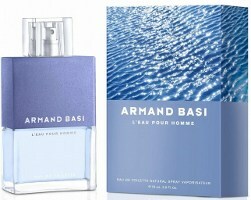 Armand Basi has launched L'Eau Pour Homme, a new fragrance for men inspired by the sea and developed by perfumer Francis Kurkdjian. The notes for the woody aquatic fragrance feature bergamot, lavender, blue breeze, cardamom, nutmeg, bamboo leaves, moss, patchouli and blue Mediterranean cypress. I love the ocean…wonder if it will be distributed in the U.S.? Often times “Sea inspired” fragrances ending up smelling like filtered air (the kind pumped into bars and restaurants), but this sounds very, very promising – especially cardamom and nutmeg – spicy, but can be done quite coolly, too. this does sound interesting (the FK reference helps! ), is it a good reason for a trip to Spain? Agreed! The fact that FK made this intrigues me, a lot! Also the previous “In Blue” is a fairly good mainstream fragrance for men in my opinion. The box reminds me of the JLO Blue Glow box. The packaging looks nice, but if it’s a replica of a classic, I’d rather still choose Cool Water for instance !